S. manufacturing data also came in at the lowest rate in two years and 10-year Treasurys have fallen to 2.36% since, near negative yields just above the inflation rate. So much for those tax cuts creating sustainable 3% to 4% growth as we warned they would not. Gary Shilling, known for his deflationary leanings, issued a warning because we can’t seem to break above the Fed’s 2% inflation target, even though unemployment has fallen from 10% in 2009 to a recent low of 3.5% (it’s currently at 3.8%). That’s a sign of deflation and recession. The second was that you only know a major bubble has finally topped when you see a first violent correction, with losses ranging from 30% to 50% in the first two or three months (the average loss is 42% in 2.6 months). 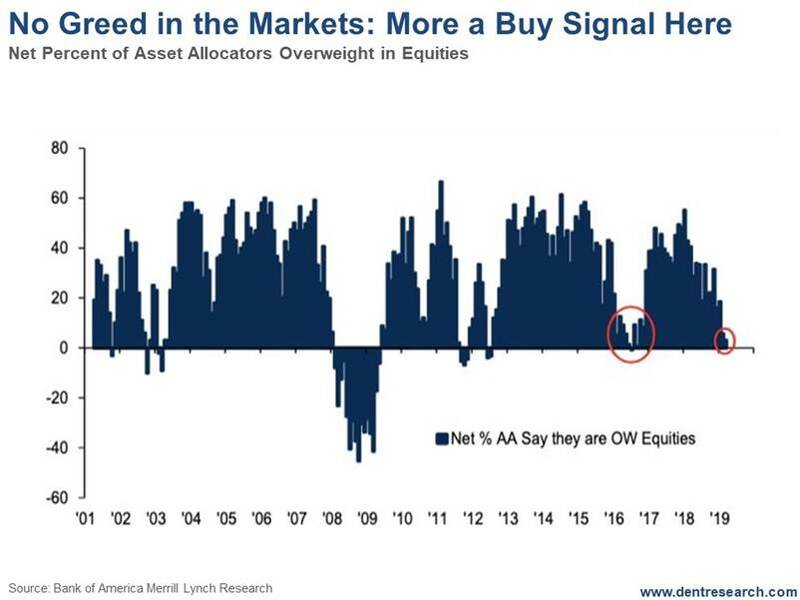 The percentage of asset allocations that claim they’re over-weighted to equities is near zero. Outside of being at the bottom of the major stock crash/recession in late 2008/early 2009, where the reading was -40% to -45%, near zero is where you want to buy! Yes, there is reason to worry. I share with Boom & Bust Elite subscribers the lines in the sand I’m watching. If any of those lines are crossed, we can start worrying earlier. If not, don’t miss the opportunities in front of you.